Mogu flesh-shapers discarded their failed creations in an abyssal shaft beneath Lei Shen’s keep. The reek of decay lured many scavengers to the refuse pit, including the great Ji-Kun. Ruthless and cunning, the monstrous bird devoured her rivals one-by-one until she held sole dominion over the shadowy tunnel. This fight takes place in a cylindrical shaft containing a large central platform with multiple nests located both above and below that platform. The encounter was designed to highlight the strong vertical elements of the terrain, without adding actual aerial combat which could have felt awkward. For example, players can gain and use a temporary flight ability to switch levels and deal with Ji-Kun’s fledglings before they mature and pose a greater threat to the raid. Split the raid up into 4 groups of 4 (each group needs a healer and 3 dps (doesn't matter if it's melee, ranged, cleave, or single target). Quills will go out while players are on the various platforms that need to be healed through. When a red shaft appears, a group kills everything on the highlighted platform. When the next shaft appears, the next group takes care of that platform, etc. When a red shaft appears above, a group that has already gone (so they have the feather buff / extra action button) will need to fly up to take care of it. Down Draft is like Le Shi's Get Away (constantly pushing players away from the boss) only more powerful. Without speed buffs like Aspect of the Pack (there is no damage going out in this phase) or Savage Roar you will have people fall off the platform. Personal speed buffs, leap, Charge, Blink, and Shadowstep, all work well for this. Grouping up in the middle before the next Down Draft is also very helpful. The main platform will get covered in green pools and you will need to heal / cooldown players through soaking them or when Down Draft happens, things will get out of hand. Shadow Priests, Rogues, DKs and others with hefty cooldowns are ideal for soaking pools. If you are on nest duty and fly too high on your way to the upper most hatchlings you will lose your wings and fall down (happened to us several times). Well done Blizzard! This is the ugly fight for the second section of LFR. There are debuffs, adds, lots of movement, and heavy damage phases. Good news for you, this is an easy fight to tank. Pick up the boss, swap after two stacks of Talon Rake. If one of the tanks has poor avoidance, Infected Talons could become an issue, but it would require only a very brief swap to clear that debuff if that were the case. During Downdraft, at least one of the tanks needs to avoid falling. If you do fall, it will kick you back onto the platform, but it takes a while. If you can charge or leap or whatever to return yourself to the middle (while running toward the center to avoid the pushback) then you should be able to stay up. Most of the DPS stays on the boss. Avoid standing in green puddles or stacking too tightly. The platform will fill with puddles by the end, so this can be more challenging than it sounds. Standing close together means that Caw will cause you problems. It is possible, in theory, to catch the green blobs as the boss vomits them upward to feed her babies. If caught, they grant a significant, stacking damage/healing buff. One small group of 3 dps and a healer are on add duty. If they do their job well, the fight is fairly straightforward. If they mess up badly, it's a wipe. There will be a message from time to time that one of the lower or upper nests is hatching. When that occurs, the group will jump down onto (or fly up to) the active nest (identified by red light and orange-ish smoke) and kill all of the baby birds inside. After killing the babies, there will be a feather that grants a flight ability, allowing the add group to fly up to one of the upper nests or back to the platform, as needed. One healer has to accompany the add group in killing birds. The others remain on the platform, dealing primarily with raid damage. The big danger is the boss's Quills attack. It's massive raid damage. Tank damage is fairly reasonable in this fight, but it can get spiky if the tank gets multiple stacks of Infected Talons. Swap after two stacks of Talon Rake. Try to remain on the platform during Downdraft. Stay spread out, stack during Quills for heals. Avoid green puddles. ~3 dps must jump down or fly up to nests as they activate and kill baby birds. There is a feather that grants you a short term flight ability in the nest. This is the most important job in the raid on this fight. The nest that is active has red light and orange smoke - watch raid chat to see whether it is lower or upper. Lots of raid damage, particularly during Quills. Try to stagger cooldowns with other healers. One healer must accompany the dps killing baby birds. /raid Tanks swap on 2 stacks of Talon Rake. /raid DPS Spread out, stack for Quills. Don't stand in green. /raid Healers stagger cooldowns for Quills. /raid Add group = 3 dps + 1 heals killing birds. Look for red light+orange smoke. Use feathers to fly. Note that Ji-Kun drops some nice vanity loot. First of we have the Cluth of Ji-Kun, a mount modeled after Ji-Kun itself. This mount can drop on normal and heroic difficulty. The drop chance seems to be about 1 % - 1.5 %. And secondly we have the Ji-Kun Hatchling which will drop from all difficulties, including LFR. The drop chance for this one is about the same as for the mount, but this will be much more common due to it being able to drop in the LFR. In the LFR this pet will be personal loot, meaning it will go straight to your inventory after you kill the boss. It is also treated as extra loot, meaning you can get a piece of gear and still have a shot at getting this pet at the same time. It is also BoP, but can be learned, caged and then traded to anyone. Did this boss last night for the first time. We wiped twice on him mainly because of his down draft ability pushing us through the puddles and off the platform. One thing that worked like a charm on our 3rd try was the use of warlock gateways. We had 3 gateways around the platform and when Ji-Kun did his down draft... we just rode it to the end of the platform, clicked on the gateway before we reached the edge and we were back in the center! Worked perfectly! Is she some kind of hippogryph? like as comparing a tauren to a taunka? Pretty sure this is a reference to the Great Rocs of mythology, said to be raptors (Bird of pray) of enormus size an able to lift full grown elephants off the ground with ease. Plus the fact theres references to Icarus also a legend in that region of time. Well played Blizzard. During downdraft, he will attack the highest threat person in melee range. This was quite problematic in my last run as some melee with abilities to keep them in range could keep unloading on him and died, yelling at the tanks for not holding threat. The issue here is that if you are not in melee range, taunt has no effect because you are not on his threat table at all if you are outside of melee range. As a DK with death's advance and Rocket Jump, I was no where near him and taunt and life grip lasted for one global cooldown while out of melee. I'm not sure what the solution here is for tanks who do not have heroic leap etc. Telling a bunch of LFR dps to not attack him during that phase is obviously pointless. I can understand "well its there fault" but leaving tanks with with that kind of situation is not very enjoyable. Perhaps a solution will be discovered in the coming weeks. To prevent or reduce the chances of Ji-kun one-shotting the DPS directly after Down Draft, the option I've seen that will work for most groups is to send a pet of some sort at the boss so it is the only one in melee range, giving the tanks time to run back. If a larger window of opportunity is needed, an Army of the Dead or Stampede can be effective, giving the boss multiple targets. Tanks that want to charge in right after the pushback should be cautious because (at least after the first Down Draft) she seems to use Talon Rake as soon as the spell ends. If a tank with two stacks charges in, s/he may be one-shotted if a cooldown is not ready. The tank which taunts first (not the one who pulls) will be the one who will need to charge back in and intercept that second stack. Warriors, Druids, Monks, and possibly Paladins should be able to co-ordinate their charges so one does not get a bad stack. Tanks without a charge or quick movement increase should be pulling first. I'll add more to this over time. 2 tanks, 2/3 healers, 5-6 dps. This boss fight is quite fun and isn't that hard compared to Megaera pre-nerf. This fight takes place on 3 different levels, the top nest platform, the boss platform and the bottom nest platforms. Ji-kun would be circling around the platform and to summon him you just run towards the eggs in the middle. He'll land about approximately 10 seconds after you do that. The raid should be split into 2 groups, the Boss group and the Eggs group. The egg group should contain 2-3 dps and 1 healer or 2-3 dps who can heal themselves during Quills. Those DPS should be good AoE classes and preferably not classes with high ramp-up time. Elemental Shamans and Hunters are perfect here. Ji-Kun herself should be 2 tanked and tanks should swap at 2 stacks of Talon Rake. Note that it is different from Infected Talons. She does Quills occasionally and everyone including those at the nests will be damaged. It isn't really that bad actually, apart from this not much damage will occur. She'll cast Caw and shoot sonic rings at people so they should spread out, if you move when she's casting this it won't hit you at all. Warlocks can place their Demonic Gateway. Druids can use their Stampeding Roar, etc. Charge & Leap abilities would work here as well. 2 DPS 1 Healer - You could get another DPS from the Boss Platform to follow you to the 1st and 3rd nests at the bottom to get wings to stack the damage buff during Feed Young. 2 Healing - The 3 dps going down needs to use their survival CDs and healing spells to survive Quills. The platforms would alternate between 3 top and 3 bottom nests, the bottom nests will have Young Egg of Ji-Kun which will hatch into cute little Hatchlings that will cheep at everyone and try to kill them. You really have to kill them before they evolve into Fledgeling and kill you. You then pick up feathers and use your special action button to either fly to the next platform or up to the main platform. You cannot pick up another feather within 1 minute and you'll have 4 charges of flight. Flying into the projectile of Feed Young to gain a 30% increase to damage/healing which increases by 10% each time you run into it again. It doesn't matter if it's the slimy goo one or the food type. But the slimy green one will give you a DoT. The top platform will have 2 Mature Egg of Ji-Kun that have more health and will hatch into a Juvenile and fly over the platform and start cheeping at everyone below, they're unable to be killed while flying above the platform unless you have wings to reach them. 2-3 of these are still ok but damage will be very spiky during Quills and Down Draft. It'll be similar to people being sniped during Council of Elders with Sand Bolt. Healers - Rotate CDs to make Quills easier but it isn't that bad. DPS - Intercept Feed Young to get a damage buff. Does anyone know where the Golden Egg is located, for Ji-Kun's acheivement? As of 4/2/13, the achievement has not been completed. /target Golden Egg does not yield a targetable object. With the feather buff flying to the upper and lower areas, there was not an object that resembled anything close to a Golden Egg. Based on the wording of the achievement, this appeared to be a Tsulong achievement 2.0. Does anyone have any other information? Fun Fact: During Noble Garden all of the Eggs have been recolored to be Easter Eggs on the Platforms. 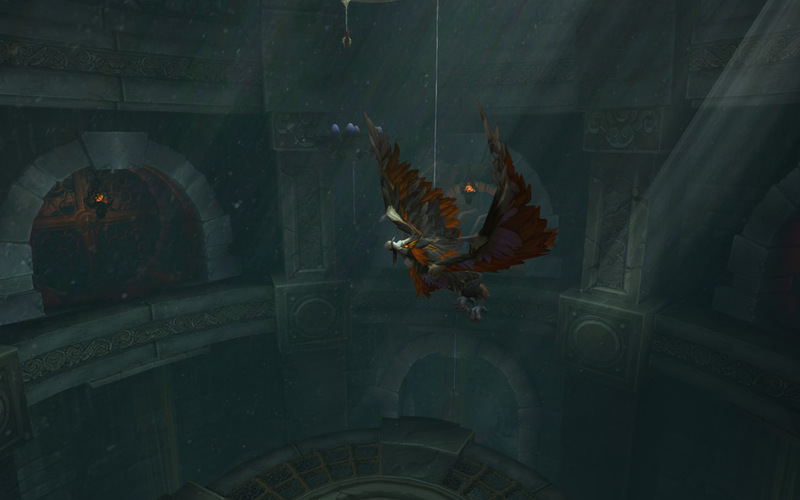 Note to the LFR DPS on nest duty: please don't steal your healer's feather unless you wish to take on that role. Thank you. On the first round, we had no problems at all killing the hatchlings before they fed on the pools, however the pools remained. On the second round all hatchlings immediately began to eat and all grew into fledgelings, because of those remaining pools. Some of those fledgelings then laid eggs and it got very hard to keep the juvenile count low. Big adds are spawning every three waves, starting on wave 2. For melee DPS on this event, specifically Rogues, the single-handed, most annoying event is Down Draft as it will push you out of melee range of boss. Or, if you are unlucky enough, you will be pushed off the edge. This won't kill you,however, but you will see a DPS drop of 10k at least. What worked for my Rogue is to save Shadow Dance until Ji-kun uses Down Draft, then Shadow Dance coupled with the talent Cloak and Dagger will make using Ambush a very good way to maintain a semblance of DPS on this boss during this phase. Other than that, staying out of green puddles extends life expectancy by a thousandfold, therefore also increasing DPS output. Which is a refined version of the one shown in the fatboss youtube guide to heroic jikun. I reccomend having it maximized on your second monitor during the encounter, or if you don't have two monitors print it out and have it sitting next to you. the chart indicates when each of the groups should jump down or fly up to the new nest. and when they should use a charge of thier feathers to collect the primal nutriment buff for extra dps. the red bars over the nest indicate that that nest has a nest guardian in it, and therefore a tank needs to go. the "D" and "Q" indicate approximate timings on downdraft and quills. timewarp is indicated: group 1 can receive it once they have collected the primal nutriment during nest 2. group 1 can then get it 5 minutes after that during nest 10. or if you have two classes that can give timewarp/heroism, group 2 can get it during nest 3 instead. at nest 14 the boss should either be dead or very close to dead. so noone should bother going to the nest and both groups should just collect the primal nutriment and blow all dps cooldowns. I would not reccomend doing this before nest 14 though since the nest guardian in nest 13 can wipe your raid fairly quickly if it isn't tanked. even if the boss is on low health it's safer to continue the strategy normally until nest 14 rather than be risky and try to burn the boss down. EDIT: as of a recent patch there is no longer any nest guardian in nest 13. so a tank does not need to jump down to that nest. It's up to you weather you still want to kill that nest so the group can get the feathers for primal nutriment buffs, or if you want to stat ignoring nests and burning the boss on nest 13 instead of 14 like the chart says. Ji-Kun fell fast enough, its one of the easiest boss in 10 and 25 after Jin'Rokh. Ji-Kun... Chi-kun... Chicken... Coincidence? I think NOT! Ji-Kun can be soloed by death knights, druids, monks, and warlocks at level 90. I'm not aware of what's going on with level 100 soloing for most classes as of the current moment, but it will likely be possible for other classes as well. - Do all of the lower nests. Try to grab as many Primal Nutrient buffs as you can. - Clear the larger birds that fly directly above Ji-Kun with a feather. - You can drop stacks of Talon Rake by leaving melee range (all she does is spam Quills, which can be outhealed at 90 and even more easily at 100). - The green pools from Feed Young will land on your position, so use that to your advantage. Soloable by hunters now, killed today as 655 BM hunter with a shale spider pet, didn't even bother with nests lol. Just keep Mend Pet up, move to avoid Caw and try not to get blown off the platform. this boss is quite easy and everything up to him can be cleared with two decently geared players. (me and my friend are 640-645ish) Hunter and Dk tank. we run together for convenience. some of the first bosses can be a little messy. DPs gets picked on when it comes to the orbs from the first boss. Troll council is nasty. need to take out the ice guy first or he will dot your dps to death. you will need good self heals or a b rez. Horridon is hard on the tank during the last 30-20% Hydras just requires a little bit of healing and the turtle boss is not that bad, although be prepared to use a cd if you miss a stone breath while you get punted around by adds. may not be as easy if you are running with other tank classes but clearing up to him for whatever reason is possible and the boss himself is a joke. just chill out on the main platform with him and don't get blown off. you don't need anything remarkable to kill him bedsides just the basic common sense to not standing bad things. Best of luck to those learning to solo or running with friends. Easy solo on 10H as a 684 BrM Monk. Use the Ox statue to soak Talon Rake and kill the nest guardians. AOE loose hatchlings with Chi Explosion as you fly to and from the upper guardians. Not sure why but according to the wowhead statistics on this page he has over 400m health on LFR difficulty compared to 5m health on 10 man normal..
You can skip almost all trash prior to Ji-Kun. After killing the second snail jump up the ramp and you'll be able to run almost all the way to Ji-Kun's platform and jump over without aggo-ing and fighting stuff if you keep hugging the wall. I recommend dismissing pets as they tend to act stupid and aggro snails at the last second - if you already made the jump, snails will get teleported to the neat, small platform of Ji-kun and chase you through the fight. Very easy to solo as a level 100, item level 700+ blood death knight on 10NM. I just did the first nest (one Blood Boil wiped out the eggs), grabbed a feather and wailed on the boss. I got a couple of nutrient buffs from Feed Young but didn't go below about 95% health and was never even close to being in danger. The fight was over in about 1 minute 40 seconds. - Only damage the boss, nothing else needed. Normal 10, 110 Ret Paladin, 779 Quest gear: This comment is for first-timers. You can avoid trash on the way by wall hugging, but if you want the Gastropod Shell you need to kill the Gastropods. They have a large hit box, stay as far back as you can because they can one-shot you if you are too close. To get to Ji-Kun, just jump off the ledge. DPS it down, no special mechanics other than the don’t-stand-in-the-bad rule. After it dies, there will be pink feathers on the platform. Use one and fly up to the alcove opening to the southwest. When you land, take the left hand stairs up to get to Durumu the Forgotten. After you kill Ji-Kun, if for whatever reason you need to get back to that platform, just jump off near it and a wind will carry you up to the platform. If you need to use a repair mount after Durumu, grab a feather and use the portal above the platform and it will put you back where Megaera was. Also, if you die or leave instance after this boss, there will be a feather for you to pick up before you get to the stairs. Use this feather and fly straight up to get past the waterfall. The open alcove will be directly above you. This guide is performed on 10-man Normal mode, and is intended for classes that have DoT damage for the solo method. All classes can complete the two-man method, if they are accompanied by a priest. Disclaimer: The video associated with this guide shows how to complete this solo. However, I complete this achievement in the video using a "dual box" setup. Not a true solo, but I do show what is necessary in soloing the achievement. I just don't have the patience to keep coming back week after week to complete this achievement. I debated posting this here, but there is still some good information in the video for people trying to solo this achievement. Recommended: Have a stop watch to track your time, or use the in-game stop watch provided. You need to complete this achievement in 20 seconds via the solo method. You also need to be in a spec that has sufficient DoT damage. Attack boss for 10 seconds. DoT up boss as much as possible. Run to lower nest by 15 seconds. Kill hatchings and click on feather. Fly up to the nest with the golden egg by 20 seconds. And, if you timed your DoTs well enough... the boss dies will you are still falling. This can only be done if you have a priest in group. Either on a second account (dual boxing), or a friend. Position the priest (other account or friend) at the edge of the platform nearest to golden egg nest. Use "Leap of Faith" from priest to pull your egg holder to the platform. MOST IMPORTANTLY: Egg holder must run and drop back down to the FIRST nest. Second account / priest friend then kills boss. I highly recommend doing this by the two-man / dual box method. Save yourself some grief and get a priest to help you with this achievement. Otherwise, you run the risk of having to farm this achievement for weeks, or even months! Soloed it as an 875 Outlaw Rogue on 10H by just burning the boss down, no need for fancy mechanics. Almost none of my melee toons, can get around the first two snails just before Ji-Kun...I used to have no problems what so ever just slipping by, but since the patch, i can be standing 15-20yards away an STILL get knocked over an eaten by an unagroed snail. Making it nearly impossible to now solo on a melee toon. My feral druid will have no problem getting past them as we can simply take the boomkin talent, however I actually had to call in a range just for my warrior to get by :/ Already put in a bug report, but has anyone else has this issue? Which is the best difficulty to try ? Anyone notice that she has a new quills animation? what's that about? Ji-Kun's young are located throughout the roost and progress through different stages of life. After a period of incubation Young Eggs of Ji-Kun will hatch into Hatchlings. When fed by Ji-Kun, the Hatchlings then mature into Fledglings. Both Fledgling Eggs and Mature Eggs will hatch into Juveniles. Young Egg of Ji-Kun – Eggs in the lower nests located around Ji-Kun's roost will periodically hatch. Once the egg hatches, a Hatchling will emerge. Hatchlings – Hatchlings will call for Ji-Kun to feed them shortly after spawning. If a Hatchling senses food nearby, it will attempt to feed. If a Hatchling successfully feeds, it will mature into a Fledgling. Cheep – The Hatchling yells with all their might at their current target, inflicting 14 Physical damage. Fledglings – Fledglings attack random players and can spawn incubated eggs. Lay Egg – Fledglings will lay eggs that are already incubated. When these eggs hatch they spawn a Juvenile. Cheep – The Fledgling yells with all their might at a random target, inflicting 41 Physical damage. Mature Egg of Ji-Kun – Mature Eggs of Ji-Kun take longer to incubate and spawn a Juvenile when the incubation process is complete. Juvenile – Juveniles quickly take to the air and fly over the main platform of Ji-Kun. Juveniles periodically cast Cheep at a random target for as long as they're alive. Cheep – The Juvenile screams with all their might, inflicting 55 Physical damage to the victim. Nest Guardians – On Heroic difficulty, some of Ji-Kun's nest are defended by Nest Guardians, which will attack any players attempting to disturb their nest. Talon Strike – The Nest Guardian strikes with both its talons, inflicting Physical damage to all enemies in a 180 degree arc. Screech – If not actively engaged in melee combat Nest Guardians will Screech, inflicting 41 Physical damage and interrupting the current spellcast of all players. Mana-using players will have their casting speed reduced by 30% until they successfully cast their next spell. Infected Talons – Whenever Ji-Kun successfully strikes a player with a melee ability the victim suffers 8 Nature damage every 3 seconds for 10 sec. This effect stacks. Feed Young – Ji-Kun spits up globs of food for her young. If a Hatchling has called out for food, Ji-Kun will aim this ability in their direction; otherwise the food will land at random locations around Ji-Kun's platform. When the food lands on the ground, it forms a Feed Pool. While a glob of food is traveling through the air, players with Flight can intercept it to prevent a Feed Pool from forming. Doing so afflicts the player with Slimed, but also grants Primal Nutriment. Slimed – After intercepting Ji-Kun's food globules the player suffers 14 Nature damage every 5 seconds for 15 sec. This effect increases the damage of the next Slimed by 10% when it expires. The increased damage effect stacks. Feed Pool – Feed Pools that form on the main platform will inflict 27 Nature damage to all players within them each second. If a player stands in a Feed Pool for 3 seconds they will absorb the Feed Pool and become Slimed. Primal Nutriment – Successfully catching one of Ji-Kun's food globules mid-air increases the player's damage by 100% and healing by 30% for 30 sec. Primal Nutriment increases damage and healing by an additional 10% each time it is applied, up to a maximum of 200%. Talon Rake – Ji-Kun uses her talons to pierce through the armor of her current target. Talon Rake inflicts 175% weapon damage as Physical damage and increases the damage received by the victim from future Talon Rakes by 50% for 1 min. Quills – Ji-Kun sends her quills about the entire roost, inflicting 18 Physical damage to all players every 1 sec for 8 sec. Down Draft – Ji-Kun flaps her wings violently, pushing all enemies on her platform outward. Down Draft persists for 8 sec. Caw – Ji-Kun cries out at 1 random player, sending piercing sound waves at their location. When the waves reach their destination they inflict 82 Physical damage to all targets within 8 yards of the impact. Caw – Ji-Kun cries out at 3 random players, sending piercing sound waves at their locations. When the waves reach their destination they inflict 82 Physical damage to all targets within 8 yards of the impact. Daedalian Wings – When an egg or hatchling from the lower nests located around Ji-Kun's roost is slain it leaves behind a feather for players to loot. This feather grants the player Daedalian Wings. Daedalian Wings grants the player an extra action button that allows players to take flight for 10 sec. !3,4 In Normal difficulty, feathers grant 4 charges of Daedalian Wings. Players can have up to 4 charges at any time. !5,6 In Heroic difficulty, feathers grant 3 charges of Daedalian Wings. Players can have up to 3 charges at any time. Flight – Players who have the Daedalian Wings buff can take flight for 10 sec. !3,4,5,6 In the Normal and Heroic versions of the Ji-Kun encounter, using Flight consumes one charge of Daedalian Wings. Lesson of Icarus – After acquiring a feather, players must wait to acquire another. !3,4,5,6 In Normal and Heroic difficulties, players cannot gain further charges of Daedalian Wings for 2 min. !7 In Raid Finder difficulty, players can pick up (and only need) one Feather of Ji-Kun.